A breathtaking Kauai sunrise gleams through a wall of windows at this newly updated studio. 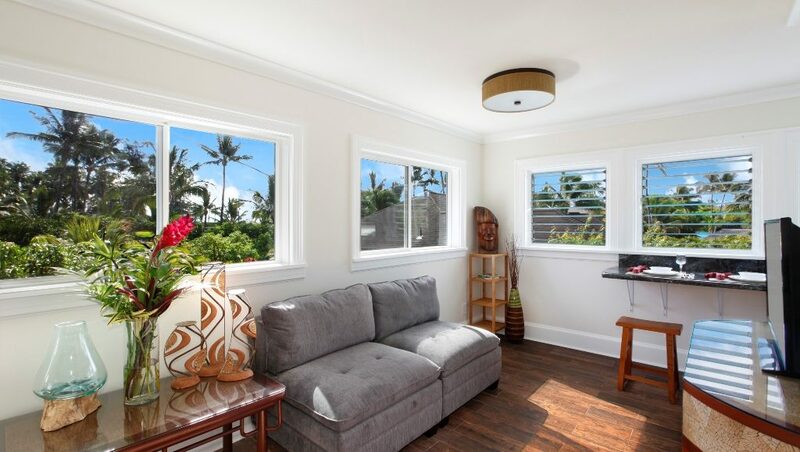 Nestled along the bank of the lovely Wailua River, your second-floor accommodations in our new vacation rental offers captivating views of the water and surrounding gardens. Drift to sleep in a queen-size bedroom with an elegant sleigh bed and mirrored closet, and refresh in a brand new bathroom with indulgent shower, bidet, and contemporary pedestal sink. Spend quiet mornings at a countertop bar with coffee and a side of water views, and whip up breakfast in a kitchenette with a fridge and induction cooktop. Even a suite of small appliances is at the ready, including a blender, coffeemaker, toaster, and hot plate. When you want a break from home cooking, treat yourself to a night out at one of the many restaurants within a mile of your door. For an upscale dining experience, make a reservation at Hukilau Lanai and indulge in a delectable food and wine tasting. Or grab a casual bite at Monicos Taqueria, serving fish tacos and fresh seafood burritos. Looking for active pursuits? Hike through lush landscapes in Wailua River State Park, and go for a refreshing swim at the base of a majestic waterfall. Hop on our complimentary bicycles and pedal along Kauai Path, or cruise down Wailua River with the kayaks and stand-up paddleboards provided. This bed has been swapped with Coco C bed.